The Mindset of a Champion follows the career of legendary blogger Byron Crawford a/k/a Bol, founder and editor of the eponymous hip-hop blog, from a dark, foul-smelling dorm room in the middle of nowhere, to his pioneering work in the field of online hip-hop journalism, in which he either coined or popularized several slang terms that are generally frowned upon, attempted to have Kanye West banned from the Grammys (years before the incident with Taylor Swift), and witnessed a vicious, passionate sexual attack perpetrated by an animal, which is described here in detail. From there, it's on to his career as one of the first - and best, he would say - professional hip-hop bloggers, at XXL magazine, where he was involved in a number of controversies, including beefs with rappers like Bun B and Lupe Fiasco, posts that mysteriously disappeared from the Internets almost as soon as they appeared, and threats of boycotts by Muslims and black feminists. Nary a feeling is spared as he reveals the hilarious true stories behind the rise and fall of his career as a semi-professional hip-hop journalist. 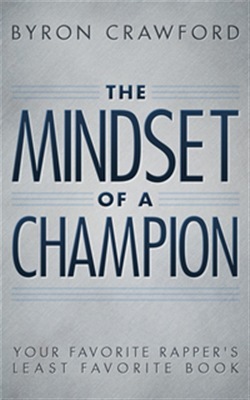 Acquista The Mindset of a Champion: Your Favorite Rapper's Least Favorite Book in Epub: dopo aver letto l’ebook The Mindset of a Champion: Your Favorite Rapper's Least Favorite Book di Byron Crawford ti invitiamo a lasciarci una Recensione qui sotto: sarà utile agli utenti che non abbiano ancora letto questo libro e che vogliano avere delle opinioni altrui. L’opinione su di un libro è molto soggettiva e per questo leggere eventuali recensioni negative non ci dovrà frenare dall’acquisto, anzi dovrà spingerci ad acquistare il libro in fretta per poter dire la nostra ed eventualmente smentire quanto commentato da altri, contribuendo ad arricchire più possibile i commenti e dare sempre più spunti di confronto al pubblico online.